The natural beauty & comfort of the original Scandinavian recliner by Hjellegjerde of Norway. Available at Chair Land. The natural beauty of real leather enhances the experience of a Fjords Scandinavian leather recliner furniture by Hjellegierde of Norway. Fjords® chairs have a soft design, and you can choose between two different sizes, small or large. The chairs are equipped with Fjords® Active Release System™, which gives you correct neck support in every position. Everything is done to satisfy your need for comfort and sitting pleasure. Fjords® Scandinavian Chairs offer adjustable comfort and functionality. The lumbar adjustment makes the sitting experience ergonomic and gives your spine good support in the right places. By means of our Fjords® Active Release System™ the neck angle can be adjusted to any position. All models are available with bases which have a 360° swivel. The base is produced in laminated, stained wood which gives it an elegant character. The variable adjustment provides continuous support and prevents your legs and back from tiring. Your individual resting position is achieved by means of a simple adjustment using your body weight. The result is a comfortable Hjellegjerde recliner that will satisfy your needs for many years. Fjord’s Scandinavian Leather Recliners. Up to 40% Less than Stressless. So why are Fjord’s Scandinavian Leather Recliners so much less expensive than eKornes Stressless Chairs? It’s our unique Outlet Store concept at Chair Land Furniture. Want to know more about what makes it unique? Find out how we offer our “Lowest Price Promise” and unbeatable prices here. We carry Fjords Scandinavian Leather Recliner Furniture because it is made with similar materials and craftsmanship to the Stressless Chair, but is less expensive. 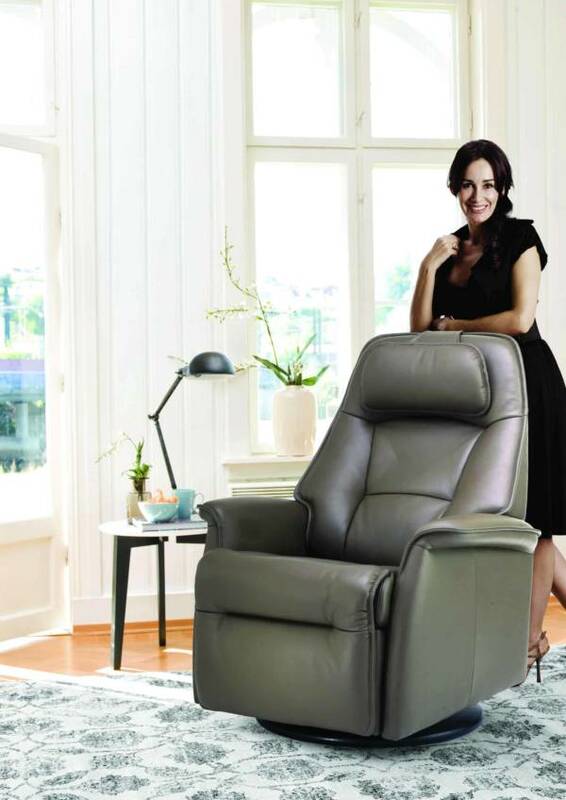 By offering it through our Outlet Furniture Store, we can deliver it to our customers for an even better price, up to 40% less than they can buy the Stressless Recliner. Fjords Scandinavian Furniture by Hjellegierde of Norway at Chair Land Furniture. Visit us today at our Outlet Store and see for yourself or order your Fjord’s Scandinavian Recliner and we’ll ship it to you.